No Lack of a View! If you plan your time wisely, this hill could easily be combined with a trip to Dursey Island to climb Cnoc Bólais, and/or Knockoura near Allihies. Leave the R572 at the Firkeel Gap before Garinish, where the Beara Way swings eastwards along a small road. There is ample parking at V53570 42130 A just before the paved road terminates. From here we followed the unpaved farm track upwards which contours around Lackacroghan, thus avoiding a steep climb through long grass and gorse straight to the summit from where the car was parked. The track passes through several gates and at V54547 42267 B turns sharp right for some 200 m. At V54531 42008 C head west to attain the summit. The ground is a little boggy in places but improves towards the top. 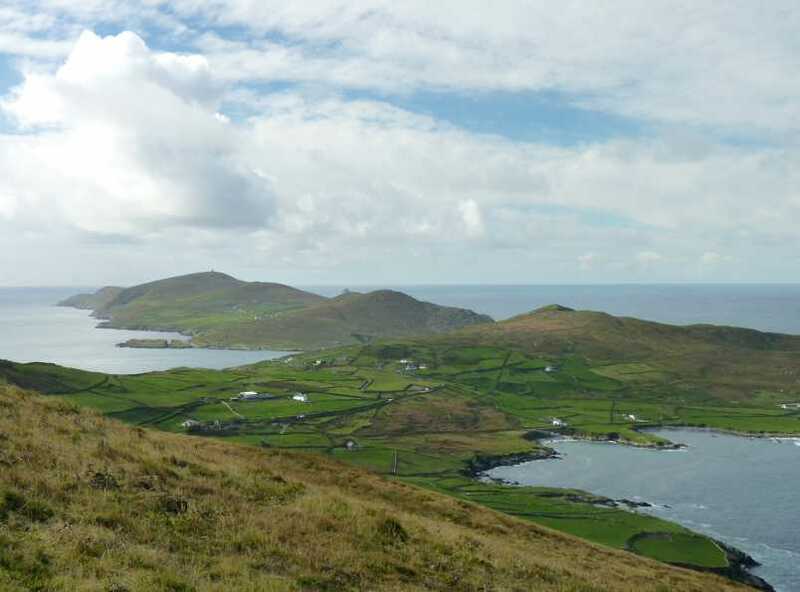 The views from the summit are spectacular on a fine day, when it is possible to see the jagged hulks of the Skellings puncturing the point between sea and sky and numerous other small islands peppering the coastline; the full length of Dursey Island, signal tower atop Cnoc Bólais crowning the top of the high ground as fanciful as any tower envisaged by Breughel; the tiny harbour at Garinish clinging obstinately to the ragged coastline; Cods Head and the delectable Ballydonegan Strand with its arc of manmade golden sand gleaming in the autumnal light, the detritus of decades of quartz crushing by the Allihies copper mines, the nineteenth century Cornish engine house at Mountain Mine just discernable in front of the majestic rib of rock that rises towards Knockoura; Crow Island and the dark stump of the signal tower on Black Ball Head, and, if lucky, the inky blue cluster of numerous peaks to the north on the Iveragh Peninsula in Kerry.